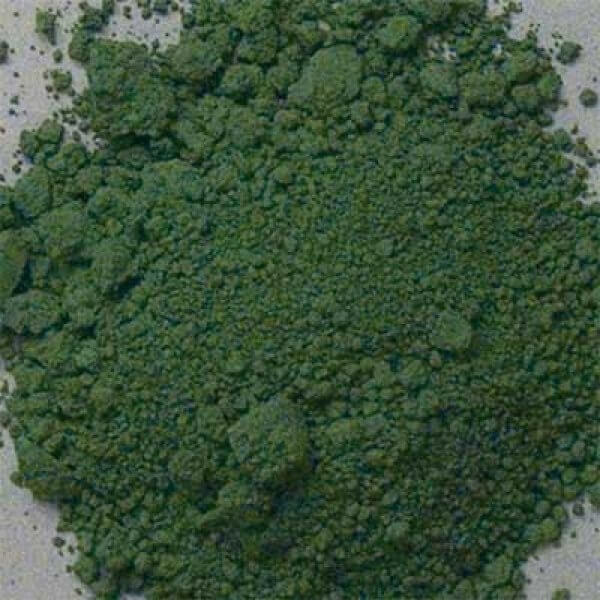 Details Chromium oxide green, also known as chromium sesquioxide or chromia, is one of four oxides of chromium, chemical formula Cr2O3. It is commonly called chrome green when used as a pigment; however it was referred to as viridian when it was first discovered. The element chromium was found in lead chromate in 1797 by Louis-Nicolas Vauquelin. The name chromium was given to the element because so many colored compounds can be produced from it. As early as 1809, chromium oxide was being used as an enamel in porcelain factories, but it was not yet used as a painting pigment. It has been written by several sources that chromium oxide was not used as a pigment until 1862, but there is evidence to suggest that it was used earlier. The pigment has been identified on a J.M.W. Turner painting which dates back to 1812. An 1815 journal entry by George Field included a homemade example of the pigment, and in 1831 Vergnaud discussed two different preparation methods, but said that the pigment was not widely used because of its high price. A catalogue of pigments printed around 1840 lists a green oxide of chromium, which is believed to be chromium oxide. Also, in 1969 Kühn, using microscopy and emission spectroscopy, found chromium oxide in three paintings which dated between 1845 and 1850. It is widely accepted that chromium oxide was used before the hydrated version. Their use has been limited, though, since these greens are much more expensive than the emerald greens or chrome greens, due to the preparation process. It is sometimes used to make lightfast paints when mixed with yellows. In the past it was used in automotive finishes and to make bank notes. The first man to prepare chromium oxide was Pannetier in Paris, but his process was kept hidden. Guignet invented a two-step process for preparing the chemical. His first step was to heat boric acid and potassium bichromate, a process known as calcining, which produced a porous mass. The second step produces hydrated oxide, boric acid, and some boron, after the mass is washed in cold water, or hydrolyzed. This is only one way of several for the preparation of chromium oxide. There is no specific chemical composition for hydrated chromium oxide since different preparation processes produce the chemical with boron, while other processes produce the chemical without boron. 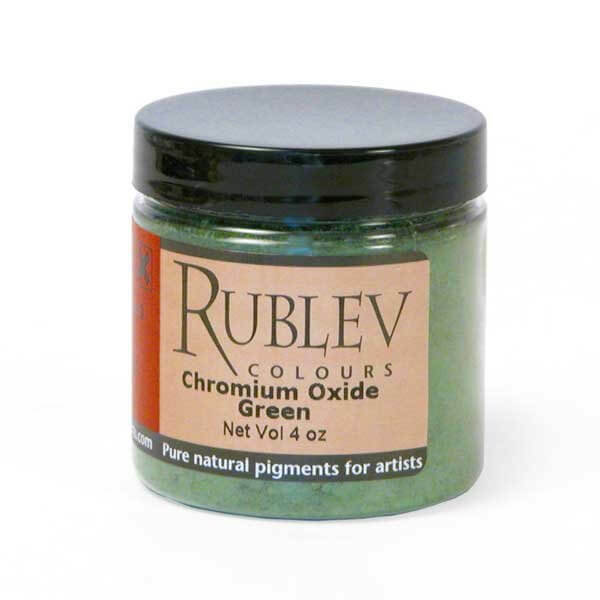 Hydrated chromium oxide is permanent, but chromium oxide is more stable and is one of the most permanent pigments an artist uses. It will not react with hydrochloric acid or with sodium hydroxide. Chromium oxide green absorbs a small amount of oil (26 g oil per 100 g of pigment). 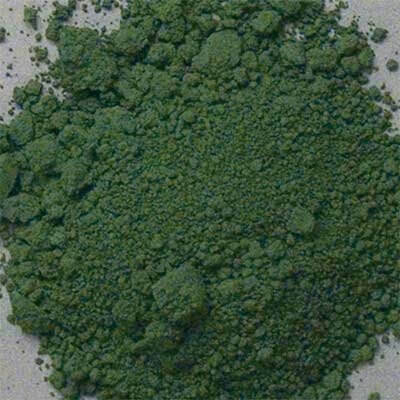 Though chomium oxide green is not a serious health hazard, it can cause irritation of the skin and eyes, and can cause nausea and other problems if ingested. It also can cause respiratory problems when dust is inhaled. It is not a fire hazard, and does not readily react with other materials.